Where To Start With Wonder Woman comics In 2017! You are here: Home / Featured / Recommended Wonder Woman Comics! Plus: Which Ones Are Free on Hoopla? Recommended Wonder Woman Comics! Plus: Which Ones Are Free on Hoopla? The excitement around Wonder Woman’s release this weekend is palpable, with fans celebrating the first stone cold knockout success in the DCEU. Naturally, fans all over are going to want more Wonder Woman comics than ever, before seeing the movie, after seeing the movie, and in some cases while watching the movie for a third time in three nights. Below you’ll find my favorite Wonder Woman reads, with designations for comics that are good for new readers, are all ages friendly, or are available for free on Hoopla Digital! Or, if you really want all the Wonder Woman you can handle, I recommend Comic Book Herald’s complete Wonder Woman reading order, from origin to DC Rebirth. My all-time favorite Wonder Woman comic, ranked near the top 50 of my favorite comics of all time, is packaged as a Justice League story. This is likely due to the fact that although the focus is on Princess Diana throughout, she finds herself in the strange position of taking on each member of the Justice League one by one. It’s a glorious look at how Diana would take on the entire Justice League, and do so without diminishing the honor and dignity inherent to her character. Plus, at the end of the all the gorgeous action, Wonder Woman fights a monstrous dragon to end all monstrous dragons. Highly recommended, and perpetually underrated! All Ages Friendly? 13+ for violence. 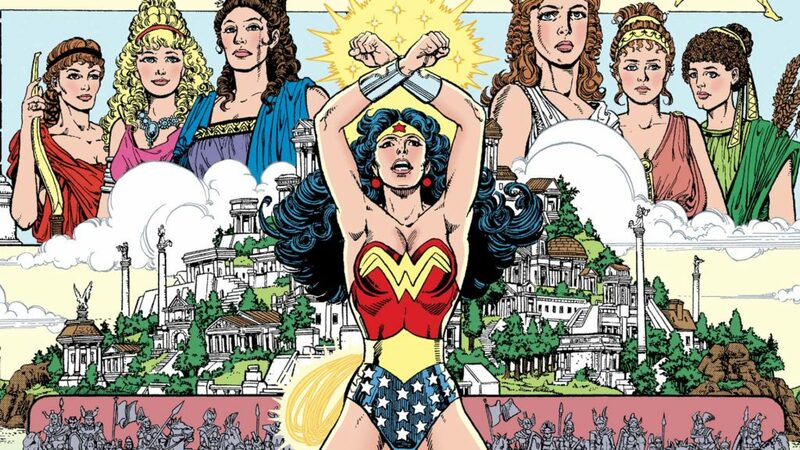 In reality, I’d recommend just about anyone new to Wonder Woman start with the complete George Perez run on Wonder Woman, rebooting the character and her mythology after DC’s Crisis on Infinite Earths . I include War of the Gods here because it’s totally free on Hoopla, and marked my first foray into the Perez Wonder Woman era. As you might guess, the series is deeply intertwined in Wonder Woman and early 1990’s DC continuity, as well as all sorts of Themyscirian and Olympian mythology. So this read is without question better for those familiar with Perez on Wonder Woman, or who have an interest in diving headfirst into what Wonder Woman comics were like in the 90s. All Ages Friendly? 16+ violent and dense! This will be confusing to the continuity obsessed, or those who like numbers that flow sequentially (see also: sane people), but the first year of Wonder Woman’s Rebirth comics switched off between two different stories and timelines every issue. So odd numbered Woman Comics were a part of “The Lies” story arc which tracks Wonder Woman in “present day,” whereas “Year One” retells Wonder Woman meeting Steve Trevor and adventuring from Themyscira to America. For my money, new readers should start with Year One , and only read The Lies after if you just need more Wonder Woman. Year One is a great retelling of the character’s origin by Greg Rucka, with some of the most joyous and inspiring Wonder Woman panels and scenes in recent memory. One of my favorite entries in DC Rebirth to date! All Ages Friendly? 11+ some gun violence. The New 52 era of Wonder Woman is both the first time I read a Wonder Woman comic and among the first comics I started collecting on a monthly ongoing basis from my local comic shop. As such, I carried absolutely no expectations and ties to classic character history, and loved the Olympian-gauntlet approach of Azzarello and Chiang. Personally, I loved this run as it was released, particularly Chiang’s character designs for Wonder Woman’s godly rivals like Hades, Apollo, and Poseidon. If you want to see how these books fit in with the rest of the New 52, I recommend Comic Book Herald’s Complete New 52 reading order. All Ages Friendly? 13+ violence, sexual situations. The story clearly occurs in the middle of the New 52, and actually introduces a few of Superman’s most fearsome phantom zone menaces. All Ages Friendly? Pretty much. Before seeing the movie last week I had not the slightest interest in Wonder Woman as a character and could not understood how she carry a comic by herself, I never saw her as being more than a supporting character. Since I saw the movie I now of course think she is the greatest superhero of them all – it really was that good a movie! – and I now find myself with 75 years worth of stories to catch up on!